I didn’t realise until Sunday that I have a burning ambition to drag a truck down a road with my bare hands. I was at the inaugural Highland’s Strongest Woman contest, cheering on my kickass personal trainer Shona and her fellow ladies of steel. Holy moly. First they did a medley of carrying heavy objects ranging from 40 to 100 kilos (88 – 220lb) over a 20 metre course. 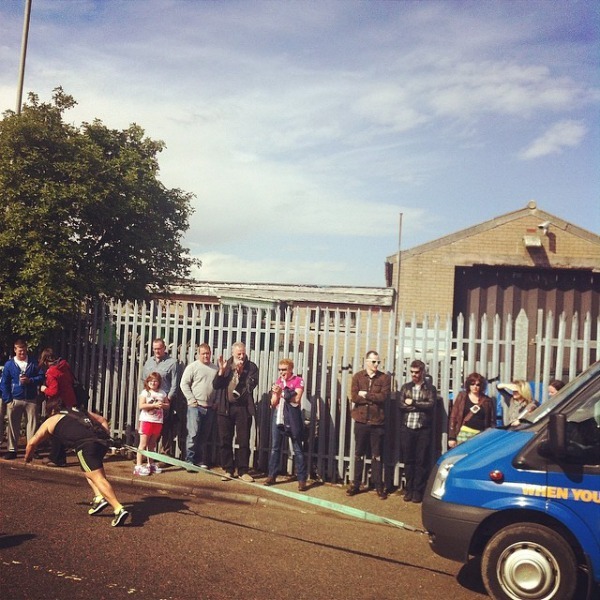 Then they had to do as many 100 kilo deadlifts as possible in 90 seconds. Then they had to press heavy weights (can’t remember how heavy) above their heads as many times as possible in 90 seconds. All very impressive, but then they did the Truck Pull & Drag. There was a rope attached to a 3 tonne truck. They had to grab that rope and pull the truck along for 20 metres, then run around to the front of the truck, jump into a harness, then haul it back in the other direction, as seen in the photo above. One could read the papers or walk the dog or go to the pub on a sunny Sunday afternoon or one could pull a truck along the road for fun. Watching those dames it seemed like a brilliant idea! They finished with the car deadlift. I think it was a Renault Clio or similar, but dude, it was a car. The three women who successfully did it then had a lift-off, with 10 kilo weight being chucked into the back of the car until finally with 60 extra kilos there was a winner. The whole event was so inspiring. The patience and determination over time needed to be able to lift like that. The guts to take part with 150 people looking on. The way the competitors cheered each other on. Gold! And of course I loved how they looked badass with their stripey socks and chalk dust. If you met them on the street you may not know about their secret strong superpowers, until you asked them to open a jar or they casually lifted you over their heads. Totally want to be like them some day! PS I typed this myself! Sorry voice dictation fans! I’ve been doing an hour or so per day. Next up, lifting mugs of tea. Then a short leap to small vehicles? Look out! This sounds AMAZING! I went to the German-American festival last summer and watched this event where women were throwing a 70-pound boulder, and I so wanted to do it, even though I cannot do one push-up. Glad to hear you are typing again! Good news about the typing! Although I do miss the voice dictation mess-ups. Literal women power. Awesome. Must have been a sight to behold. I’ll miss the fun of the Aussie Dictator but it’s good to hear you’re back typing. The mention of mugs of tea as a motivational tool reminded me of watching the documentary series ‘5 seconds to Disaster’ with an old boyfriend, Dave. We always joked that it wouldn’t be a disaster if those involved had access to a cup of tea. Inspirational! Good to be reminded that women’s bodies are not meant to be merely ornamental, as is usually the case in the media. My former trainer always threatened that he was going to make me pull a car. (It was an idle threat… I was nowhere near these Amazons in strength). You had me at ’40kg’. I can’t even contemplate lifting that amount. How inspiring.